Celebrate the spirit of Australia with the rugged beauty of our Banjo bouquet. 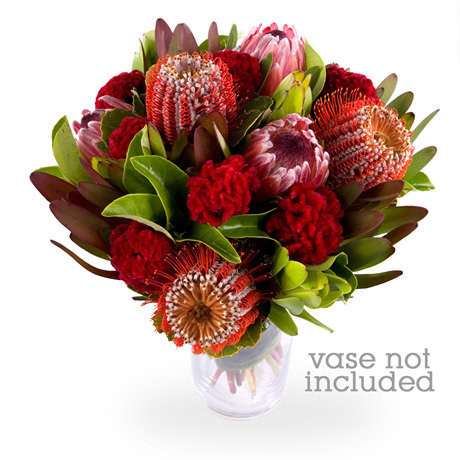 This robustious flowerscape is a blend of rich crimson, pastel blush, and fresh mossy green, and incorporates proteas, leucadendrons, celosia and coccineus. Evoke a whirlwind of images with this earthy bouquet; the dusty hues of Uluru, the tenacious terrain of the outback, starlit nights in the wilderness and wild kangaroos traversing grassy plains. This collection of stems exemplifies the understated aesthetics of our homegrown flora, and would be an ideal gift for a proud Australian. The Banjo does not come in a container, however we recommend adding a large glass vase to contain your flowers. This vase ensures a low maintenance gift, as well as becoming a keepsake.